Lectures are free and open to the public. The SALA Lecture Series qualifies for British Columbia Society of Landscape Architects Continuing Education Credits. Members of the Architectural Institute of British Columbia and the Royal Architectural Institute of Canada may self-report this activity for Learning Unit consideration. 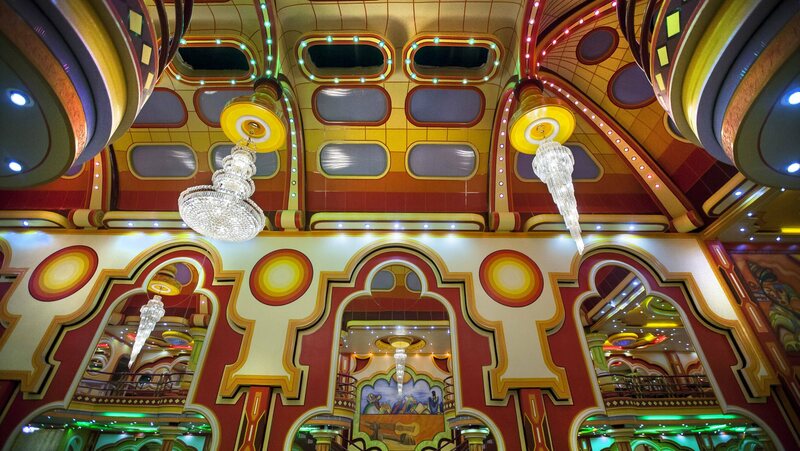 But the admirers of Freddy Mamani, as he is generally known, say his colorful “new Andean” style has also served to reinvent a city once aesthetically monochromatic, and that he has found a way to bring traditional Andean and Tiwanaku cultures into an urban setting. A recent show at London’s Architectural Association School of Architecture displayed a four-piece exhibit of Mamani’s architecture titled Salones de Eventos, or Party Hall. A documentary is in production detailing the architect’s life and architecture as well. 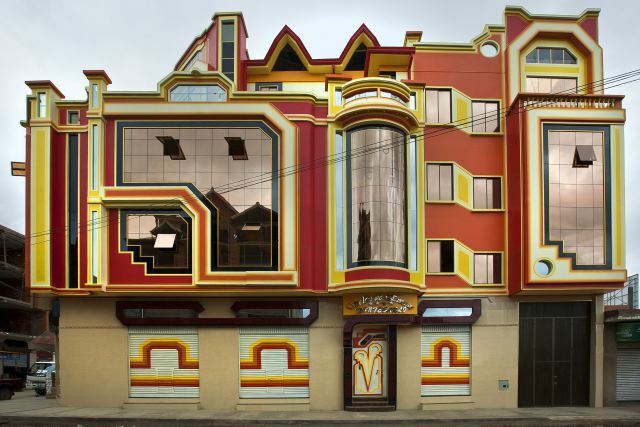 An Aymaran architect, Mamani was a pioneer of this architectural style, says Elisabetta Andreoli, an architectural historian and co-author of The Architecture of Freddy Mamani Silvestre. Quartz tried to speak with Mamani directly, but was unable to reach him after several phone calls. O-14, a Dubai tower by RUR Architecture, is covered by a concrete exoskeleton that creates a chimney effect, pipping hot air up through the three-foot-deep space between the perforated shell and the building’s glass windows, keeping the interior cool. As more areas of the world face desert-like conditions due to climate change, this kind of passive climate control could be used to reduce buildings’ carbon footprint. These ideas, from a structure made of recycled milk cartons to algae that can boost a sinking city, actually scale. Architecture is one of the key drivers of climate change. Between construction and the energy required to keep buildings up and running, the industry is responsible for nearly half of the carbon emissions in the U.S.. Technologies and energy-savvy design can lower emissions, and in some cases, even generate energy. But scale proves a significant challenge. One off-the-grid tiny house won’t put a dent in the world’s carbon emissions. Canada’s award-winning entry at last year’s Venice Biennale in Architecture — a look at Arctic buildings past, present and future — kicks off a national tour this month at the Winnipeg Art Gallery. “Arctic Adaptations: Nunavut at 15” includes soapstone models, made by Inuit artists, of some of Nunavut’s best-known buildings. Ideas for housing, arts and other projects in the next 15 years are also featured. A video explores the show inside Canada’s pavilion in Venice. Surrey’s PARKit Design Challenge 2015 – “Dueling Pianos” The City of Surrey is calling for submissions in the 2015 PARKit Design Challenge, a competition for the design and installation of a summertime pop-up park in Surrey City Centre. Individuals and groups (students and professionals) are invited to submit their unique ideas for a creative, sustainable, outdoor public space capable of supporting 2 street pianos, part of the Pianos on the Street program. The winning team will receive $15,000 to fabricate and install their design. Honorariums will be awarded to second ($500) and third place teams ($250). The 2014 PARKit design challenge was a great success and we received some fantastic entries by very creative teams –students and professionals. The winning entry was entitled “Gingham style” and was inspired by the traditional picnic basket fabric. The PARKit site is located adjacent to Surrey Central SkyTrain station, in the North Surrey Recreation Centre parking lot. This area has become an important pedestrian hub, linking SFU Surrey, Central City Mall and City Hall with the SkyTrain. PARKit Design Challenge entries are due May 1, with the winner announced on May 8. The site is expected to be installed by June 22, and will remain open through the summer. A site meeting is planned for March 24 at 10 am. They ask all applicants to register for the program and RSVP for the site meeting by sending an email to beautification@surrey.ca with your contact information. Students are especially encouraged to apply! The City developed PARKit in 2012 as a pilot project to create temporary public park space, and to test the feasibility of mobile food trucks in City Centre. The Design Challenge was introduced in 2013 to evolve the PARKit concept. A longtime professor at the School of Landscape Architecture at the University of Montreal, Ron Williams is a founding partner of Montreal landscape architecture and urban design firm Williams, Asselin, Ackaoui & Associates. He has participated in many award-winning projects including the Montreal Beach Park on Ile Notre-Dame, the Biodome, the Jardin de l’Espace Saint-Roch and the rehabilitation of Avenue Honoré Mercier in Quebec City. His new book, Landscape Architecture in Canada, comprehensively documents the role landscape architecture has played in shaping Canada’s landscape. The lecture will be followed by a reception sponsored by Tremco Roofing and Building Maintenance. ALPOLIC Materials is one of the world’s leading manufacturers of aluminum and metal composite materials. Located in Chesapeake, Virginia, the facility began production in 1991 and continues to set the North American standard for innovation and quality. 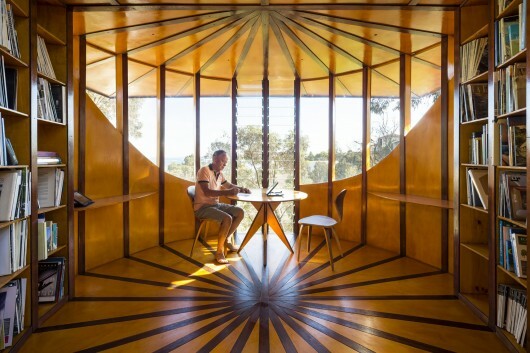 What do you do if you’re an award-winning architect in need of a new home office, and you don’t want to extend or alter your impressive heritage-listed home? 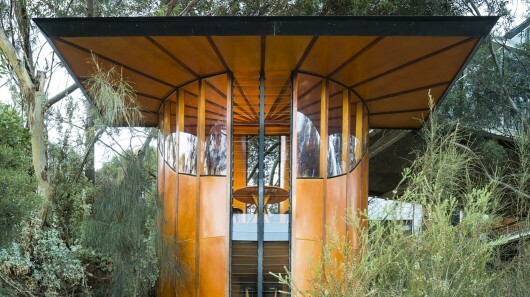 Well, if you happen to be Australia’s Max Pritchard, you roll your sleeves up and get busy building yourself an equally impressive forest retreat in your garden. With the exception of the wiring, Pritchard tackled all of Tree Top Studio’s design and construction himself, including the bookcase and circular table that are installed within. Please join us for an opportunity to meet AIBC’s Chief Executive Officer, Mark Vernon, CA, CPA (Illinois). Learn more about Mark. Attendees are encouraged to stay for an AIBC Council meeting that will be held from 1-3 pm. Per Continuing Education System (CES) guidelines, neither the meet/greet session nor the council meeting qualify for learning units (LUs). Happy belated New Year to all AIBC members, honorary members and associates! I’m pleased to start the New Year with this opportunity to report back to you on the results of Engagement 2.0, the second phase of AIBC’s internal stakeholder engagement. The purpose of this initiative was two-fold: to implement a credible process to build stakeholder trust, and; to gather input that would help council shape changes that are coming to the AIBC. I believe we have achieved these goals on both fronts. First off, thank you again to all those who participated in person and online. Engagement 2.0 was held over a 12-week period between September and December 2014. During this time, 29 events were held in multiple locations and with multiple ways to participate. 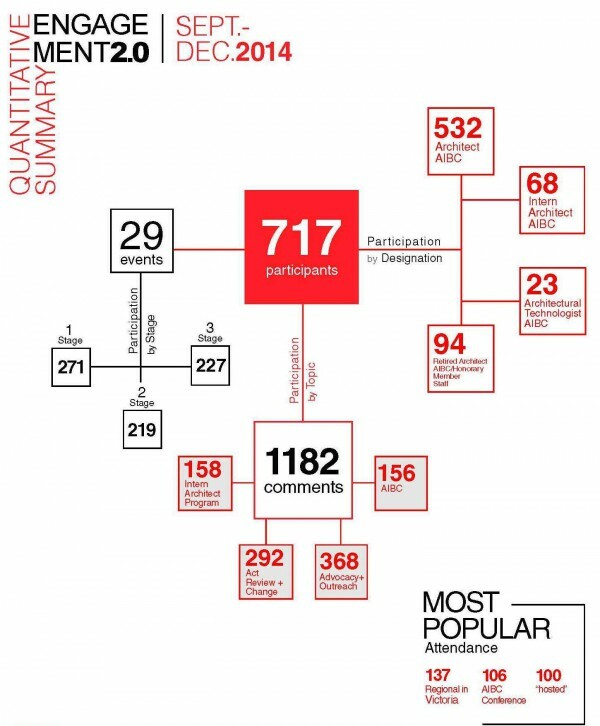 There were 717 participants (with some participants attending each of the three stages) and more than 1,100 comment submissions. Based on findings from the open houses you attended in April 2014, Engagement 2.0 was presented in three topic-specific and distinct stages: About the AIBC; Act Review and Change; Public Outreach and Advocacy. Each stage was accompanied by information handouts, presentations and online comment cards. The handouts and presentations remain available on the AIBC website. A copy of the Engagement 2.0 Final Report, prepared by the consultant, is also available online. Engagement 2.0 created an opportunity for healthy dialogue and discussion. Equally important, it allowed council to canvass the appetite of members and associates on a number of key issues. With this invaluable input in hand, I’m pleased to announce items your council is currently working on in the areas of Public Outreach, Act Review and Change, and “the AIBC” (specifically but not limited to the Intern Architect Program). The area of most interest during Engagement 2.0 was public outreach so I will begin with this topic. There was strong support for the AIBC to implement activities and programs that increase public understanding of architecture, the role of the architect and the value they and the profession offer society. To this end, a council committee will be struck to design a Public Outreach Strategy that complements and expands on existing AIBC programming. This committee will explore items raised during the engagement exercise and define appropriate types of outreach to municipalities, schools and other public audiences. So we are clear and to dispel any confusion regarding the use of the term “public outreach”, we are defining it as raising public awareness of the profession of architecture and the value architects contribute to the built environment. We believe the term “public outreach” better reflects what the AIBC can do in this area. “Advocacy”, “public education” and “public awareness” seem to cause unnecessary confusion as a result of the broad scope and personal interpretation of the terms. Another common theme in this stage was the relationship and interaction with the RAIC. Several very interesting ideas were put forward. AIBC CEO Mark Vernon recently met with the new RAIC president, Samuel Oboh, and their new executive director, Ian Chodikoff, to discuss a defined working relationship and ways to align on key projects. Stay tuned as these discussions lead to future initiatives, programs and events. There was overall support for the AIBC to continue to pursue housekeeping changes to the Architects Act. Intern Architect Program (IAP) experience requirements to be consistent with national agreements. Broadly Experienced Foreign Architects (BEFA) experience requirements to be consistent with national agreements. Ability to set up limited liability partnerships (LLP). Non-compliance to the Continuing Education System (CES) to become an administrative matter. Addition of a Duties and Objects section, consistent with other modern self-regulating professions, to clearly define the institute’s core purpose. Briefing notes on these five submissions are found on the AIBC website. Read briefing notes on IAP and BEFA experience requirements. Read briefing notes on duties and objects, LLP, CES. In addition, many comments spoke to “getting on with it”. In keeping with this momentum, the Act Review Committee was tasked to provide council at their January 27 meeting with a strategy for next steps including an additional list of housekeeping items. Council approved the motion to pursue this strategy, including the ongoing and ever important notification of members. As many of you know, the Architects Act falls under the portfolio of the Ministry of Advanced Education. It is primarily with this ministry that we liaise on a regular basis, though there are occasions when we are called to participate with other government departments. Earlier this year, I sent a letter to Minister of Advanced Education Andrew Wilkinson congratulating him on his recent appointment, introducing our new CEO Mark Vernon and requesting a meeting, at his earliest convenience. The purpose of the meeting will be to provide him an overview of the AIBC and profession and, more importantly, gauge his willingness to assist with changes to the Act. Mark and I look forward to discussing with him and his ministerial team how the AIBC can contribute to serve the public’s interest on behalf of the architectural profession. A number of them were operational items already underway and/or noted in the strategic plan such as, annual analysis of intern architect and registration stats; regularly scheduled surveys to measure program efficacy; website audits to ensure information accuracy; and strengthening post-secondary stakeholder relationships. The DMG is keen to launch an “Intern Friendly” initiative, a grassroots, firm-based, AIBC-supported program whose goal is to formalize “best practices” that promote and encourage intern architects, the value of registration and the road to licensure. Cultivating a culture of mentorship, facilitating access to Construction Administration (CA) hours and a number of other initiatives will be discussed. Through crafting and implementing a set of “best practices” and including a tracking mechanism, firms can demonstrate their commitment to encourage the professional development of the next generation of architects. In tandem, intern architects play a key role in contributing to the healthy growth of the architectural profession. I invite all firms, large and small, to participate in this vital endeavor by contacting members of the DMG committee. Together we can build a thriving profession. Though not specifically presented during Engagement 2.0, the Associate Task Force was a point of conversation and I would be remiss not to include an update on this long-standing and finally resolved issue. The findings from the ATF-lead Retired Architect Survey, conducted November-December 2014, demonstrated resounding support for the “Retired Architect AIBC” designation to remain a regulated associate class. With that settled, a motion was approved at this year’s January 27 council meeting to establish notification language for all three associate classes: Retired Architect AIBC; Intern Architect AIBC; Architectural Technologist AIBC. Council is scheduled to review and vote on the notification requirements at an upcoming council meeting. Council will take into consideration all member feedback provided during the 30-day feedback period. An online form has been set up for your comments. In completing this, its final task, council thanks the members of the Associate Task Force for their hard work and dedication and announces that the Associates Task Force is now closed. As for operational items such as improving website navigation for easier access to information, developing opportunities for distance learning, and offering business courses geared for architects, these and many other recommendations are currently being reviewed. By all measures, the AIBC Engagement 2.0 initiative was a tremendous success. Participation levels demonstrated a dramatic increase and there was healthy and honest dialogue about a number of key issues. AIBC Council and staff have responded by taking steps on a number of actionable items, as outlined above. Please stay tuned as we continue to roll-out programs and initiatives that address your concerns and support the institute’s strategic plan. You will be hearing from the institute through periodic blasts like this one, but also via eNews, AIBC’s weekly e-newsletter. Information sessions on the three bylaw amendments are scheduled in February, followed by an e-vote in the spring (the first ever at the AIBC) on these same bylaw amendments. Meet and greet sessions with the new CEO Mark Vernon will be announced shortly. Be sure to mark your calendars for this year’s annual meeting to be held on May 2, 2015 at Simon Fraser University (downtown Vancouver campus) where we look forward to circling back with you on council and operational initiatives. As always, please feel free to contact me at president@aibc.ca or AIBC’s CEO Mark Vernon at mvernon@aibc.ca on any matters that are of a concern to you with regard to the profession. Quick overview of mutual recognition agreements currently pending and/or being pursued: MRA between Canada, New Zealand and Australia pending formal signing (scheduled in February); preliminary meeting between Canada and Japan set for February; Canada and Architects’ Council of Europe (ACE) discussions well under way. The Governance Committee presented an Action Plan for recommendations provided in the Best Practices Governance Audit report, which was recently completed by external consultant, Framework Partners Inc., at the request of the Governance Committee. A brief update was provided in advance of FICOM’s meeting. The institute continues to experience good financial health, with the forecast to out-perform the 2014 operating budget by approximately $130,000. The 2015 operating and capital budget was approved by council on November 18, 2014. The 2015 fee and fine schedule is stable for a third year in a row, with the exception of a 5% fee increase for temporary licences. The Engagement 2.0 Final Report was presented to council. Read the Engagement 2.0 Final Report. Council would like to thank all AIBC members and associates who attended. The participation level was tremendous and the feedback shared invaluable. Highlights of next steps include: setting up a committee to design a “Public Outreach” strategy; defining a working relationship with the RAIC; meeting with government to pursue housekeeping items to the Architects Act as recommended by the Act Review Working Group and approved by council; and, the pursuit of Diverse Membership Working Group recommendations such as launching an Intern Friendly Initiative. These and other plans were outlined in detail in the February 12 President’s Message. The results from the recent Retired Architect Survey demonstrated overwhelming support to maintain “Retired Architect AIBC” as an associate class. The survey, conducted November 20 to December 5, 2014, garnered a very healthy response rate of 18% for architects and 63% for retired architects. Read the Retired Architect Survey –Memorandum. Council approved a motion that regulatory requirements need to be established for associates to disclose their AIBC associate status. This would apply to all three associate classes: Retired Architect AIBC; Intern Architect AIBC; Architectural Technologist AIBC. Council is scheduled to vote on the disclosure requirements at an upcoming council meeting. An online form has been set up for member feedback. With the work complete, the Associate Task Force is now closed. DMG presented a final report based on the survey results of the Diverse Membership Survey, which was conducted June 19 -July 31, 2014. Council charged the DMG with recommending policies, practices and mechanisms to encourage a diverse and valued AIBC membership. Read the Diverse Membership Survey Final Report. Supported by member feedback garnered from Engagement 2.0, council approved the ongoing pursuit of five “housekeeping” items as well as a strategy to maintain this momentum, including the ongoing and ever important notification of members. November results were as follows: 75% NCARB passing rate for Intern Architects; 89% passing rate for Intern Architect Oral Reviews; 100% passing rate for Architectural Technologists. Mandate, Vision, Values: Council approved a motion on the institute’s vision. The full suite – Mandate, Vision and Values – is posted on the website. CES Update: The CES compliance rate of members for 2014 was 97%. Non-compliance by members and associates now becomes a professional conduct matter. E-Voting Update: Council approved rules for electronic voting for council elections and bylaw amendments. Read the Council Rules for Council Elections and Council Rules for Bylaw Amendments. Now that these rules are in place, the next step is to select a service provider, currently underway. An e-vote on three bylaw amendments is scheduled for the spring. E-voting for council elections is tentatively scheduled for spring 2016. Stay tuned for more information on e-voting procedures and dates. E-voting Background: At the AIBC annual meeting in May 2014, members approved bylaws to allow e-voting for bylaw amendments and council elections. As part of the AIBC’s ongoing effort to give members an opportunity for feedback (enshrined June 2014 in Bylaw 12.1 and Bylaw 12.2), a 30-day notification period was triggered in late December 2014 and extended to January 27, 2015. During this time members were encouraged to provide feedback. Seven comments were submitted by members for consideration by the bylaw review committee and council, none were contentious. Upon review, council approved the motion to accept the rules for council elections and bylaw amendments. Certified Professional Program (CPP) Working Group: An Interim Report was presented to council. 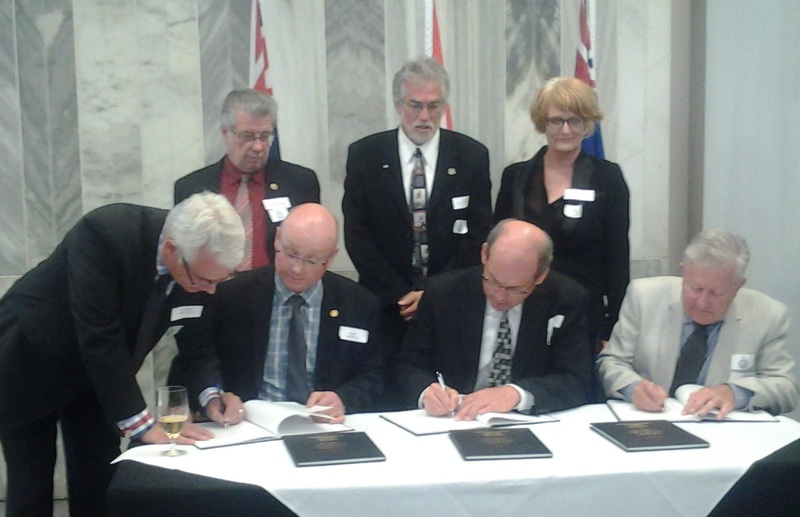 Jointly coordinated with APEGBC, an updated Certified Professional course, will be offered at the AIBC this fall. Stay tuned for registration details in the coming months. A CP Program Manager has been hired on a contract basis to manage the program. Illegal Practice Statistics: The total number of infractions / inquiries reported in 2014 was 131. Forty-three were substantiated (files opened). As of December 2014, there were 60 open illegal practice files and 32 files were closed in 2014 with 11 undertakings reviewed. Illegal Practice Findings are posted on the AIBC website. Staff changes: Roisin O’Neill, Director of Registration and Licensing and Human Resources, left the institute to join the College of Dental Surgeons of British Columbia. Joan Hendriks is currently the acting Director, Registration and Licensing until the position is filled. Tracy Tough will temporarily take on the Human Resources portion. Aleta Cho will be retiring in February after 30 years with the institute. Internal changes will accommodate Aleta’s departure. A status report was submitted by former Executive Director Michael Ernest Architect AIBC and current CEO Mark Vernon, CA, CPA (Illinois). Read adopted November 18, 2014 Council meeting minutes. The next official meeting of AIBC Council is scheduled for March 10, 1 p.m.-3 p.m. at the Harbour Towers Hotel & Suites located in downtown Victoria. Members, associates and the public are welcome to attend; please confirm your attendance in advance by emailing Tracy Tough at ttough@aibc.ca. Please note: a meet and greet with the AIBC’s new CEO Mark Vernon will be held prior to the annual meeting. 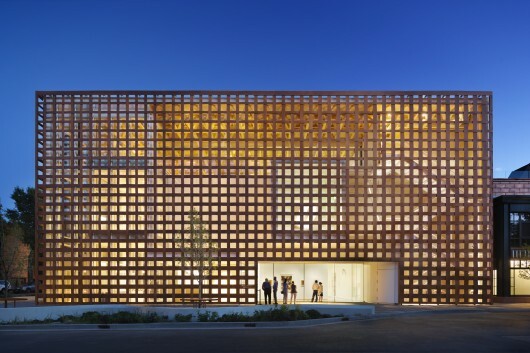 The session will run from 11:30 a.m. to 1 p.m.
Wood Design and Building Magazine has announced the winners of its 2014 Wood Awards. Run in partnership with the Canadian Wood Council, this year the awards included for the first time an international awards category in addition to the North America awards. With 166 submissions, the 24 awarded projects were selected by a jury consisting of Larry McFarland (Principle, McFarland Marceau Architects), Brigitte Shim (Principle, Shim-Sutcliffe Architects) and Keith Boswell (Technical Partner, SOM). This all-day course with founder/owner of Vintage Woodworks, Jim Stiven, covers the construction and operation of double-hung wood windows and a full demonstration of the disassembly and repairs to a double hung wood window. Learn how to open painted shut windows, how to repair dropped window weights and broken sash cords, how to replace broken panes, properly paint a wood window, and how to install weather stripping. The course will discuss storm windows and the strengths and weaknesses of new window technologies, and why wood windows remain the best option in heritage buildings.